Château Musar is neither the Lebanon’s oldest or biggest winery – both those titles belongs to Château Ksara which was founded 1857 and contributes two thirds of the countries production – however, since it was exhibited at the 1979 Bristol Wine Fair (impressing Christies head of wine Michael Broadbent and journalist Roger Voss enough to regale it as the “discovery of the fair”) Musar has created an envious, some may say cult, international following. This is partly due to the charismatic and irrepressible force that is Serge Hochar, son of founder Gaston Hochar, and the unique characteristics of the Musar wines. I do not intend to re-hash the entire Musar story as it has been told many times before and by better writers than me – Andrew Jefford’s two Decanter articles here & here are excellent pieces to delve into – however there is something special about this tale and since Château Musar (the ’99 Red to be precise) played a role in the beginning of my journey into wine it would be remiss not to cover the facts. Gaston Hochar, son of wealthy Lebanese banking family, developed an enthusiasm for wine while in France in the late 1920s and set up his winery as a hobby in the cellars of the 17th Century Castle of Mzar in Ghazir, north of Beirut. His son Serge, born in 1939, initially studied Civil Engineering before completing his wine education in Bordeaux and bottling his first Musar vintage in 1959. Together with his younger brother Ronald, a lawyer, the two sons took over the running of the Château – Serge in control of the vineyards and cellar with Ronald managing the business side. The 1970s saw major upheavals for the Château, with Gaston dying at 62 years of age and Lebanon plunging into a two decade long civil war. With his wife and young children quickly smuggled out of the country Serge continued to make wine, although the fighting in 1976 was so bad that no grapes could be picked in the vineyards 30 miles away to the east in the fertile Bekaa Valley. However with most of its wine sold locally Musar’s customer base disappeared, so the Hochar’s looked to Europe for new customers, specifically the expanding market in the U.K. which has always been more open to new ideas than its neighbours, not being a wine producing country itself. The success at the 1979 Bristol Wine Fair led to international recognition and plaudits, with Serge being named as Decanter Magazine’s inaugural “Man of the Year” in 1984 (ironically another year when a Musar Vintage could not be produced). The baton has since been passed to the next generation, with Serge’s eldest son Gaston, now in his 40s, taking over the day to day running of the Château and winemaker Tarik Sakr working on the vintages since 1991, but Serge still plays a role in the tasting and blending of the wines and doing what he is famous for, promoting Musar and Lebanese wines around the world as head of the Union Viticole du Liban (LIVL). For a taste of his character listen to this 2006 interview on GrapeRadio.com whilst Elizabeth Gilbert’s excellent 2004 interview for GQ magazine can be downloaded from the Musar website. The grapes come from over 180ha of vineyards, including the Château’s own 60ha near the village of Kefraya in the Bekaa (recently certified as organic). The vines range from 25-60 years old for the red varieties (Cabernet Sauvignon, Cinsaut, Carignan, Grenache and Mourvedre), and 30-150 for the white (the indigenous Obaideh and Merwah, a small amount of Ugni Blanc and some test plantings of Chardonnay). The winemaking style is non-interventionist, with limited chemical use, the use of wild yeasts and no filtering. Internationally there are 3 Musar labels, the Château (Gaston Hochar), the Hochar Père et Fils and the Cuvée Réservée, each with a white, a rosé and a red. A 4th label, Rubis, is a young wine for the Lebanese market only. Serge has called the Cuvée a “simpler wine”, without oak aging and released early, and the Hochar Père et Fils “more serious”, aged in oak and released after 3-4 years, but it is the Château Red that is the benchmark, fermented in concrete, aged for 12-15 months in oak, bottled in its 3rd year and then laid down until release, 7 years after vintage. This in itself is atypical; while most wineries are thinking of cash flow and try to get their wine sold as soon as possible the Hochars have millions of bottles ageing gracefully in the cellars of Mzar Castle in Ghazir, and not just the newer vintages, even on release the Château holds back a relatively high percentage of the 600,000-700,000 bottles for further development. And so to my own limited experiences of Château Musar. In the last 3 years I have drank 4 different bottles – not exactly a large amount, but enough to have had a large impact on me. The first was the 1999 Château red, a bottle I have fond memories of, as it, along with a Château Kefraya 2004 Les Bretèches, were the 2 wines that led me to Wine Library TV (Episode 115) and indirectly to my participation in the WLTV Forums where I “met” Ken and Donna and so to Reign of Terroir! I savoured its delights in June 2007 and the depth of flavour was immense for what I classed as a medium bodied wine. Then earlier this year I took part in a 3-way international “simultasting” of the 2000 Château red with two friends from the Wine Library Forums, one in Kyoto, Japan, and the other in Philadelphia, USA. Trying to synchronise tasting across 3 diverse time zones was a fun experience in itself, as you can read about in the thread, and led to me opening my 3rd Musar, the 2001 Château white the same evening. It was this wine that eclipsed its older brother, at times reminding me of a red wine with light tannins, a sherry with subtle oxidation and a dry Hungarian Tokaji Szamorodne with a salty tang. This was a white wine like no other I had tried before, and I loved it (although I suspected at the time I would be in a minority!). Finally, and most recently, I had the 2002 Hochar Père et Fils, which had a rich “beefy” nose, a little of the trademark V.A. and herbal aspects, while in the mouth it was well balanced with gentle tannins and a long berry finish. Of the 4 wines the 2000 red was a worthy 3+/5, while the 2001 white and 2002 Hochar Père et Fils were both a delicious 4/5. The star was the 1999 red though, one of the most enjoyable wines I’ve had and a strong 4+/5. As to how Musar is perceived elsewhere, there is no shortage of devotees. It would seem that that first exposure to Musar in 1979 had a lasting impact on Michael Broadbent as he is another self-confessed Musar fan, as is his son Bartholomew whose company, Broadbent Selections, imports and sells Musar in the U.S. You can see them on three early episodes of IntoWineTV tasting the 2004 Chateau Musar Cuvee Rosé, the 2006 Chateau Musar Hochar Pere et Fils, and the 2004 Chateau Musar Cuvee Rouge. 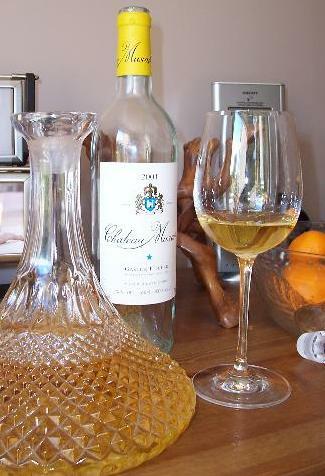 If you have an adventurous or romantic streak when it comes to wine drinking then it’s hard to imagine a better wine to try than Château Musar, and it is still affordable compared to other wines that have reached similar “cult” status yet in doing so have pushed themselves out of many people’s price range. In the U.K. a bottle of the current 2001 Château red can be found relatively easily (my local Waitrose has it in store, while Tesco has it on-line) for £14-18. For more tasting notes to whet your appetite then try these links to Decanter, The Wine Anorak, the excellent article by Lindsay Groves on Tony Aspler’s site, The Wine Doctor and Tom Cannavan’s wine-pages forum. It is probably a combination of many factors that contribute to the wine styles that can so often polarise the opinions of those who drink them. The natural “management” style of winemaking means that each vintage is usually completely different to the previous, and for the red a high Volatile Acidity (V.A.) is typical with the wild yeasts used imparting an “animal” or “barnyard” characteristic. For the white there is an oxidative aspect and a texture and taste quite unlike most whites which makes it possibly the most intriguing of the range. These are all part of the Musar uniqueness but such is the trend nowadays to regard these simply as flaws or signs of poor winemaking that many can’t get beyond these to the quality that lies within. If you are in this camp then I can only accept that wine tasting is subjective, and give thanks that I am one that enjoys this type of offering! This entry was posted in In Vino Veritas, Wine Producers, Wine Regions and tagged Chateau Musar, Lebanon, Reign of Terroir. Bookmark the permalink.